F.W. 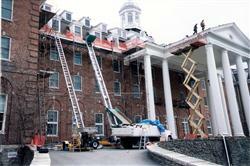 Dennis Roofing Specialists, LLC, is a second generation roofing contractor serving the northeast. We have 41 years of experience as a roofing contractor of slate, tile, copper and steeplejack work. We specialize in slate, tile, and copper roofing, new as well as repairing existing roofs. Our services cover everything from commercial to residential work. We have a complete sheet metal shop for custom copper work including standing seam, batten seam and flat lock copper roof systems fabricated in house. We also have aerial services with man lifts ranging from 48 feet up to 130 feet in height. We also provide masonry and waterproofing services for tuck pointing, brick repair and stone repair.